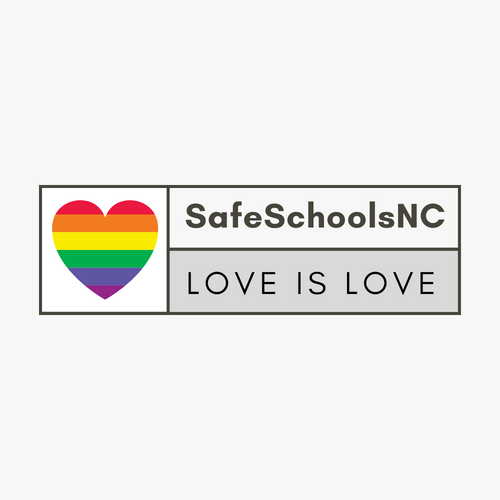 Welcome to the SafeSchoolsNC 4th Annual LGBTQ+ Conference for Staff and School Communities! Here you will find out session information, session presenters, and the session feedback links. This presentation is intended for a diverse audience of practitioners, activists, teachers or anyone interested in creating safe positive school cultures for all students. Disrupting Heteronormative School Cultures will help participants identify and define terminology associated with the LGBTQ community. ​We will explore the manifestations of homophobia within the schools, share and reflect upon the barriers to disrupting heterosexism, and collaborate on ways school leaders and teachers can confront homophobic language/actions/curricula within the schools, specifically at the elementary level. 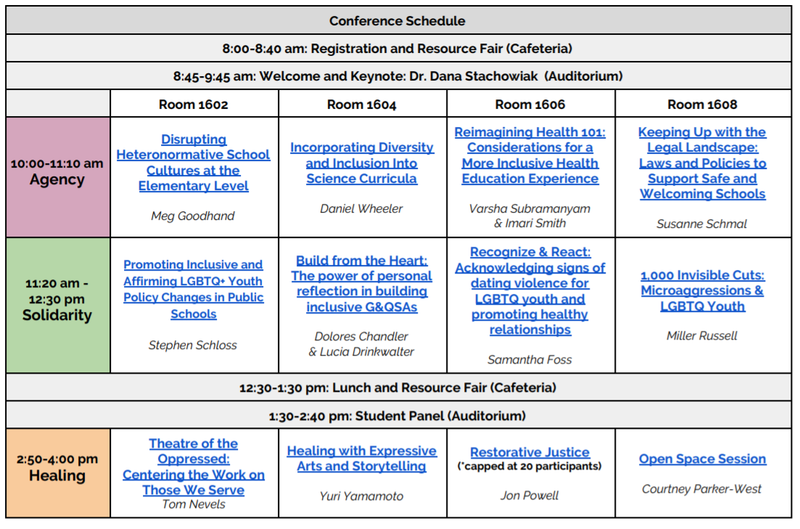 In addition, participants will be provided with ideas and resources to utilize at their own schools to begin to disrupt heteronormative cultures. With increasing awareness and acknowledgement of LGBTQ+ student populations, the desire to update health education curricula is more urgent than ever before. Health professionals and educators must prioritize creating inclusive environments for students of all sexual and gender identities as a strategy to improve disparate health outcomes. Issues relevant to this particular student demographic often goes ignored during instructional settings, failing to provide LGBTQ+ students with the information and resources they need to best maximize their health outcomes. Outcomes also vary by race, class, and other facets of individuals’ intersectional identities. This workshop will aim to discuss the critical gaps in current health education curricula in addressing the differing needs of LGBTQ+ students, especially LGBTQ+ students of color in navigating decisions about their health. In addition to its mission statement, Morehead Planetarium and Science Center (MPSC) also has a diversity and inclusion statement. As part of the philosophy that informs these statements, MPSC has an Outreach Department that serves all 100 counties of North Carolina, and it is devoted to promoting equity and inclusivity in its science education. People who are LGBTQ+ affirming are called to stand-up to restrictive funding, policies, and procedures in our schools that isolate LGBTQ+ students and empower divisive school culture. This breakout session will provide LGBTQ+ affirming individuals with the information and techniques to promote full affirmation and inclusion of LGBTQ+ youth in public schools. Participants will learn to develop individualized action plans that influence local school and district funding, policy and procedures, and resource decisions to cultivate safe, affirming learning environments. This interactive, empathy-building activity will ask participants to engage directly with common microaggressions that LGBTQ youth may face as a way of understanding the cumulative impact these often invisible acts of prejudice and discrimination can have on youth well-being. Through facilitated discussion and activities, we will define what microaggressions are, discuss why "micro" does not mean "insignificant," and strategize age-appropriate responses to disrupt microaggressions in solidarity with LGBTQ youth. In this session, we will explore signs of dating abuse while as well as how to discuss dating abuse with students. LGBTQ youth experience significantly higher rates of dating violence than their cisgender and heterosexual peers. Studies show that transgender youth are the most vulnerable to dating violence with 89 percent reporting physical violence, 61 percent reporting sexual coercion and 59 percent reporting emotional abuse. By raising your awareness of LGBTQ-specific dating abuse dynamics and intervening when appropriate, you can help support LGBTQ students right to safe and healthy relationships. In this workshop we will be working from two assumptions: 1) We are historical bodies. 2) It is not enough to do the work of anti-racism in your head. You must also do it in your heart. This workshop will provide participants with an opportunity to self-reflect and strategize ways to expand participation in Q&GSAs. The Theater of the Oppressed, established in the early 1970s by Brazilian director and Workers' Party activist Augusto Boal, is a participatory theater that fosters democratic and cooperative forms of interaction among participants. Theatre is used as a rehearsal for people who want to learn ways of fighting back against oppression in their daily lives. Open Space is an opportunity for participants in the conference to take stock of their own learning by proposing the ideas that they want to discuss most. It’s a chance to connect and network with other conference participants around the topics that you find most compelling. The law of mobility offers to participants the freedom to circulate among multiple conversations and no topic is considered off limits. Come and have the hallway/water cooler/ parking lot/ copy room conversation around the issues most relevant to you right at the conference. In this session, participants will explore and deepen how their identities and cultures interact using expressive arts and story sharing in a safe and brave space. After a brief introduction and meditation on their identities, primarily—but not limited to—with respect to gender and sexual orientation, participants will decorate a blank mask. Then participants will share their stories with each other. While a blank mask and art supplies will be provided, participants may also bring their own materials.